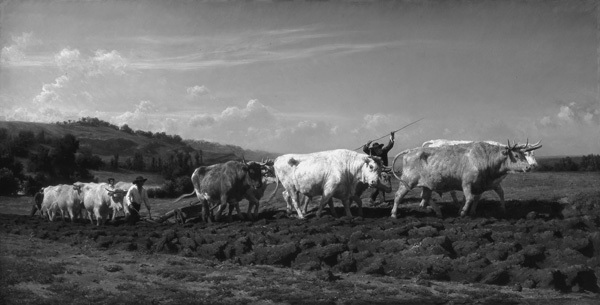 Rosa Bonheur had won international fame for her scenes of horse fairs and plowing oxen. She went to abattoirs and open markets to study animals, and she dissected them to learn their anatomy, like Leonardo Da Vinci learning the four chambers of the human heart. But she had to get a letter of permission from the police to wear trousers. Paris from 1850 to 1900 was a place of curiosity, fervor and restrictions. The city was casting off vestiges of its medieval past and transforming into a cosmopolitan center. Architects were replacing cobbled streets with wide avenues and parks, turning on thousands of streetlights and giving houses numbered addresses. And in cafes and attics and low-rent studios, painters and sculptors were transforming Western art. A woman in Paris at that time could not go out alone. She could not run an errand or sit at a sidewalk table with a cup of coffee without a man in charge, and she certainly could not go to a museum or make sketches, or set up her easel in a pasture -- or earn a commission to buy colors and canvas. But women across Europe and America were coming to Paris to paint. A community of women grew, and this summer a show at the Clark Art Institute is bringing them together again. “Women Artists in Paris, 1850–1900” opened June 9 and runs through Labor Day. The exhibition comes to the Clark in its third presentation (after appearances in Denver and in Louisville, Ky.) and brings together more than 80 paintings by 37 women. Some of the artists – such as Berthe Morisot, Mary Cassatt and Marie Bracquemond -- rose high among the Impressionists and are still well known today. Others struggled to become known, with the support of their friends, in a hostile world. Laurence Madeline, the chief curator for French National Heritage and formerly curator at the Musée d’Orsay in Paris, curated the show with Suzanne Ramljak of the American Federation of Arts, which has partnered with museums for more than 100 years to create traveling exhibits. For this presentation, they have worked with Esther Bell, senior curator at the Clark. By the mid-19th century, Paris already had a reputation as a creative center. Women came across the Atlantic, from the reaches of Poland and Russia and the far north, to paint and study in the city of light. “It was where you wanted to be as an artist,” Madeline said. France’s most prominent school, the Ecole des Beaux Arts, was closed to women until 1897, but some teachers opened studios. At the Académie Julian, a private art school, women could follow the same courses as men, though not in the same rooms. In a self-portrait, Elizabeth Nourse looks squarely out from her easel with a brush in her hand. Madeline said Nourse came to the Académie from Cincinnati, then a center of art for women. After three months, Nourse’s instructors told her she knew enough to work on her own. Outside the Académie Julian, women lived together and met in each other’s living rooms. They sketched together on the shore and in cramped garrets. On the wall near Nourse’s portrait, the Swedish artist Mina Carlson-Bredberg stands in a room of her own in a smock shirt. At the upper left, a window lets in a corner of light and a view of chimneys. She is high up, Bell said, probably on the top floor of the building, six stories up a spiral staircase to a small space hot in the summer and cold in the winter. But it is hers. She fills the canvas, central, smiling. With teachers and friends, a woman could begin a career. But to become an artist, she needed tools, paint and canvas and a place to work. She needed a place to show her work, to earn recognition, support -- and commissions. In France, she could not do all this alone. It was against the law. In 1804, Madeline said, Napoleon replaced medieval laws with his own code. Under his rules, a married woman could not own or sell property or conduct business. Women who wanted to make a living by painting had to rely on men to show and sell their work. Because they could not go out alone, women met in their own homes, she said. They painted a charged interior space. They sit in long gowns, reading, leaning over a lavish table or playing the violin on the lawn. Berthe Morisot, one of the most prominent artists in the show, swirled silver-grey strokes into satin in “Woman at her Toilette.” Madeline said the woman depicted in the painting is engaged in the one art men would approve for a woman -- the art of making up herself. “And it is a masterpiece in her handling of paint and imagery and color,” she said. A gallery of women and children holds the same sense of beauty and paradox, Madeline said. These are intimate portraits, alight with an intense love in the mother’s expression as she looks at the child asleep in her arms. That love could come with costs. A mother had no legal say in her children’s lives, and if her family disapproved of her, she could lose her children. A woman who wanted to spend her time painting could feel afraid. She could also feel torn. Women were not meant to work, Bell said, because taking care of children was meant to be their full-time job. Many of the artists felt that pressure in their lives and in their art. Mary Cassatt, who had no children, made much of her living by painting mothers and children, Madeline said. Cassatt became known for them because they were what people expected her to paint, and she knew it, and it frustrated her intensely. She did not want to be seen as a “woman artist” but as an artist. At the same time, she wanted, needed, to make her own way and pay her own way through her painting. In vivid color, her “Child Picking Fruit” shows a mother holding a baby who reaches up to touch a ripening apple. Cassatt did not mean it as a religious allusion, Madeline said, not a Madonna or an Eden, but as an illustration of science and curiosity -- the mother helping her child to see and touch and learn the world. She turned her conservative commission into a story for the future of the child and the freedom the mother hoped her baby would grow to feel. The mother holding the baby might have given up freedom for her family. It was a choice these artists felt incessantly. A woman had few ways to support herself, and if she could not earn a living by painting, marriage was one of her very few options. But unless her husband was supportive of it, she would lose her art. Some husbands did support their wives in their work. The Danish painter Anna Ancher married the painter Michael Ancher, and they appear in the exhibit in a painting they created together, sitting in a warmly lighted room side by side and looking at their work at the end of the day. Berthe Morisot had her husband’s backing; she married Eugène Manet, brother of the leading Impressionist Édouard Manet. But her older sister lived another story. Berthe appears in the show in the only surviving portrait by her sister, Edma Morisot Pontillon. Both sisters were artists. They studied with Camille Corot, and for 12 years they would travel together, paint together and show their work together. Edma, two years older, exhibited at the Paris salon for four years -- the clearest mark of recognition for an emerging artist and her best chance to sell a painting for enough to keep her in oil paints for a few months. But Edma married and almost immediately gave up painting. In a painting later in the show, Berthe depicts two women sitting gravely together in silence. She may have been painting her sister and herself on the eve of the wedding, Madeline said, as Edma gave up the work and they both tried to cope with the loss. Some artists defended their lives for a time. Marie Bracquemond fought her husband for years for her work, Madeline said. Bracquemond is known now as a force among the Impressionists, the equal of Cassatt and Berthe Morisot. She married an etcher, and as Impressionism took hold in France and in her imagination, she moved away from clean print lines toward larger canvases, brighter colors and plein air. But her husband disapproved, and though she had exhibited at the salons and had been deeply involved, eventually Bracquemond gave up the fight and put down her brushes for good, Madeline said. Even with the support of their community, their families and artist friends, women artists faced a broader challenge as they emerged, Madeline said. Artists who made it as far as an exhibit in a salon or a gallery had to contend with the world at large. Critics, often male, could be damning. Even if you have strong women artists, Madeline said, the way they are talked about can make or wreck their reputations. The public response to the women’s work often was to reject or patronize them. And if a work earned recognition and praise, Bell said, competitors would turn against it. Male artists and critics often responded with mean comments and caricatures of the womens’ work, stripping the artists of success. This harsh reception, or a sense of quick recognition that flickered out, has continued to mark many of these artists long after their own deaths. As she searched for work she wanted for this show, Madeline said, she found some paintings in such poor condition that she could not restore them. Some were kept in damp storage, and even the collections that kept them had not shown them in decades. Even works that were well known in the artist’s lifetime, or when they were first shown, had fallen into obscurity. But as she put this show together, Madeline said she has begun to see a change. Some of the works she looked for have been put on permanent display and became iconic. The Norwegian artist Kitty Kielland, for example, now has a retrospective show now in her home country, Madeline said. At the Clark, sunset tints the lake and rowboat in a landscape painting of hers that was bought by the royal family. And in Ellen Thesleff’s “The Echo,” a girl calls out over a summer field. She is standing in the final room of the exhibit, surrounded by young girls, discovering the world and her own power in it. Madeline looks hopefully at their open faces and smiles.